Of the 8 priority habitats five are present in the project area; lowland calcareous grassland, coastal and floodplain grazing marsh, wood pasture and parkland, ancient and native woodland and arable margins. SSSIs – There are 523 ha of SSSI within the proposed project area with the majority in unfavourable recovering condition. This land will be a high priority for us and we will encourage a high standard of management and the creation of buffers and habitat links with the aspiration of “More, bigger and better joined up” as highlighted in the Lawton Report. Priority Species – Of the 21 listed species several are known to be present within the project area. Land managers within the respective locality will be provided with guidance on how to conserve them. Arable Plant Assemblage – Surveys have highlighted the presence of uncommon arable plants and the project will encourage and help monitor suitable options. The Wild Pollinator and Farm Wildlife Package – This should be deliverable by all the predominantly arable farms and the facilitator will help to ensure that there is some co-ordination between neighbouring farms. Water Quality – The Adur has been highlighted for nitrate levels and the Lower Arun for both nitrate and phosphate. Work in conjunction with the SDNPA and others will help farmers improve management such as through the use of winter cover crops. 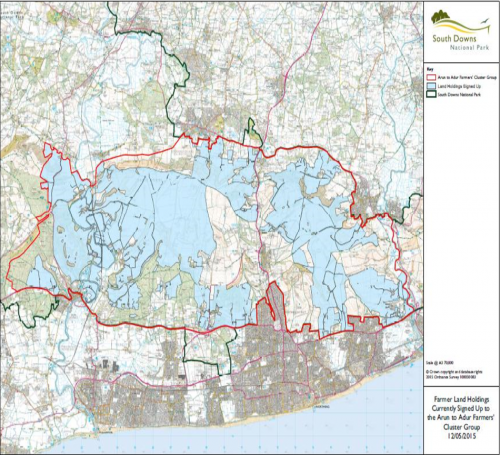 Southern Water has expressed an interest in working with the group to improve groundwater, and the farmers will be able to progress the Nitrate Modelling Project developed by the South Downs Way Ahead NIA. Historic Environment – The project area is extremely rich in archaeological interest and many features have already been protected through ELS and HLS options.